When I was in Elementary School we had a gym teacher named Mrs. Remynse. Each year one of the things that we needed for school was a pair of tennis shoes. We would hang our tennis shoes on the bar that supported our seat on our desk. It was with great pleasure that we put those shoes on when we were told to do so before going to Mrs Remynse’s class. I don’t remember anyone not liking gym class. It was a time to get out of our seats and move around. Mrs. Remynse was a short Indian lady with a strong accent. She had many fun games for us to participate in but first we had to do our exercises. Most of the time she had this record that she played and we did our exercises by what the record said. I remember the record had a catchy tune with lyrics for pushups, sit ups, and other things. This is a small part of the old lyrics. If you are my age you might remember the song. It is part of President Kennedy’s physical education program that he felt was so important for our youth. Sometimes Mrs. Remynse wouldn’t play the record. Instead she would line us up in a circle and do a game called “Do as I do.” This game had us all take turns going into the middle of the circle. There we were supposed to do an exercise and everyone making up the circle was supposed to do the same thing. One kid might jump on one foot, another might do pushups, another might swing their legs awkwardly. Whatever the middle person did we all had to do the same. Being kids 7 or 8 years old there was always someone who hadn’t made up their mind what to do. When entering the circle they might put their finger on their tooth as they contemplated what exercise to perform. The kids making up the circle would invariably put their fingers on their tooth to jokingly do exactly what the leader was doing. From an early age we learn how to do things by copying other people. Skills in the physical world are passed down from generation to generation. Think about all of the things you can do now and things you don’t even think about the beginnings of. Do you remember first learning how to tie your shoes? Think about learning to walk or ride a bike. Every day in life we are repeating things that we were showed how to do. We learned that by doing exactly what someone else was doing we could acquire the exact skill that they have. All of these new skills are brain things. We finally succeed in doing them and we remember what we did. We remember what our instructors (usually our parents or teacher) did as they were teaching us and try to copy them. From our earliest memories we have continuously learned skills through demonstration. Think about learning to talk. There is a continuous growth from words that we hear and remember. Then we learn what the words mean. Finally we remember the words, their meaning, and how to form the words with our mouth. Years ago a new bracelet came out. 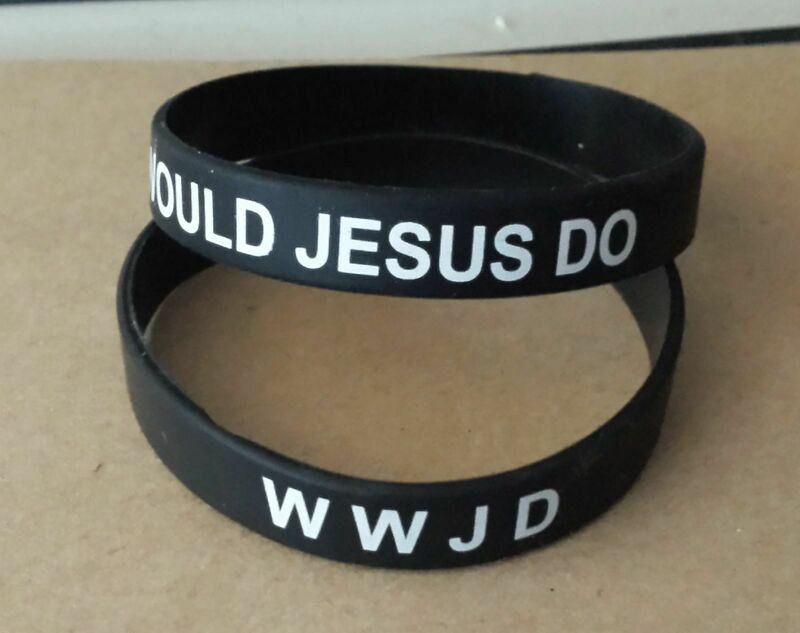 A youth group leader at Calvary Reformed Church came up with the WWJD bracelet to help her group remember the phrase. The movement spread and the bracelets became popular to wear. With that bracelet on people might watch their actions. Instead of just doing something because they wanted to it was now put to the question “What would Jesus do?” It is an interesting question but it is the wrong question and here is why. The disciples who lived with Jesus every day and observed everything that he did were told a truth by him one day. In John 16:7 he said..Nevertheless I tell you the truth; It is expedient for you that I go away: for if I go not away, the Comforter will not come unto you; but if I depart, I will send him unto you. You see while Jesus was on this earth in human body form he could only be in one place at a time. With the Holy Spirit we can all have him in our hearts. The What Would Jesus Do bracelet sends the message that we are to think about what Jesus would do in a situation and make our decision accordingly. The truth is we don’t have to think of what Jesus would do. It is already in our hearts if we have been born again. As a result of us accepting him as our Lord and Savior, the Holy Spirit comes in and lives in our being. He discerns what is right or wrong in our heart. If we listen to his small voice he will lead us through the spirit. It is no longer a brain thing. Many times we do not go down the road that gets us into trouble. We do not have to think about what Jesus would do in given situations. One thing that Jesus always did however was to never do anything without an agreement in his spirit. He was always led by the spirit in everything he did. Like us he was in a human body. That body had hurts and temptations just like ours does. For instance Jesus had a struggle with going to the cross. He knew that was the reason he was here but when it came time he struggled with completing the mission. He overcame by relying on the spirit that was within him. That is what we must do as Christians. We need to get out of that thinking with our brain in spiritual things. God may call you to do something that makes no sense in our traditional way of thinking. The Bible asks us Where is the wise man? Where is the scribe? Where is the debater of this age? Has not God made foolish the wisdom of the world? I Corinthians 1:20. At an early age we learned to do as I do. Unlike the exercises we used to do as kids we are all not supposed to do the same thing. The spirit might be telling you to do something completely different than me. God uses what we have to offer for his glory. When we are led by the spirit we take our hands off the the wheel and let him drive. We do that by not thinking with our brain but thinking with our heart. Thinking with our heart works because we are led by the spirit in all things. It is time everywhere for Christians to walk in the spirit and obey his voice in all things. If you want to know what Jesus would do that is it!